Microsoft PowerPoint and classroom chalkboards, once considered tools of choice for student presentations, now seem so 20th century. Today's Web 2.0 savvy youngsters want to share their work with the world. Their movie-making, podcasting, and vidcasting efforts require 21st century tools to transform their projects into Web-compatible formats. TechSmith's Camtasia for Macintosh is one such digital tool. This powerful screen recorder can create movies and record audio directly from a computer screen for publishing on the Web. Teachers can use the Camtasia for Macintosh to produce instructional videos introducing or reviewing difficult concepts drawing on content they've recorded from their computers. Students can do likewise, presenting work, demonstrating how much they've learned, explaining how to use a particular software tool, and capturing information from their computer screen as they explore topics, conduct research, solve a math equation, run a computer program, show interaction with a Web site, etc. Pros: Some teachers would argue that Camtasia for Macintosh is an unnecessary expense because Apple Computer's free QuickTime player for Snow Leopard is all that's required to record computer screen activities and (with a microphone) even voiced narration. However, if you haven't yet outfitted your computer with Snow Leopard, or you want a more robust tool than Apple's QuickTime Player, Camtasia for Mac will deliver. It's a user-friendly Web 2.0 digital content producer that combines powerful screen capture at up to 30 frames per second with audio recording tools and movie making options not available in Apple's free QuickTime X Player. Plus you won't need an OS upgrade to use it. For example, like QuickTime X, Camtasia for Mac captures only an entire screen, not a user-selected region. But Camtasia for Mac has built-in cropping capabilities that enable you to cut away unwanted portions of the captured screen. 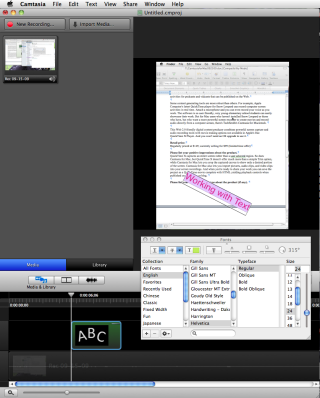 Camtasia for Mac also lets you import pictures, audio clips, and video clips into your screen recordings. When you're ready to share your work, you can save the project for export directly to YouTube or an iPhone, or output the footage as an HD-quality H.264 MPEG-4 movie file complete with embedded playback controls suitable for viewing on a Web site or in a blog. You can also export your Screencast in QuickTime, AVI, and 3G cellular formats. In addition to capturing what's on the computer screen (e.g., a Keynote or PowerPoint presentation running in slideshow mode, a digital video clip, or your screen activity as you work), Camtasia for Mac will also capture video from an iSight or digital video camera connected through Firewire while simultaneously recording sound coming from the computer speakers. You can have an audio track playing music in the background, plus a separate track for voice narration. Macintosh users familiar with iMovie will appreciate how Camtasia for Macintosh uses a Timeline format for playback and editing. Simply drag media images and clips into the timeline and put them in their own tracks, then trim them to delete unwanted video or uneventful moments of silence. There are options to apply transition effects as the Screencast plays through, add special effect filters, adjust the volume of the audio and the size of the canvas, overlay text, zoom in on sections you want to feature, and much more. You can even save a single video frame as a still image for use in other applications or to reimport into your movie. Cons: Camtasia for Mac runs on Leopard OS X 10.5.6 or later, so it requires relatively robust, up-to date hardware, software and RAM. The Macintosh version of Camtasia does not come with an add-in toolbar for Microsoft PowerPoint. Camtasia Studio 6 for Windows does, allowing users to record directly from that program. Movies and project files created by Camtasia for Mac and Camtasia Studio for Windows aren't interchangeable. Work created by Camtasia on one platform cannot be opened or edited by product users on the other platform. Overall evaluation: Camtasia for Mac is very versatile, delivering powerful screencasting and editing software to teachers, administrators and students who want to create presentations and other computer-generated videos. First-time users will appreciate its excellent Getting Started and How-To tutorials, many of which are in video format. Would you buy this for your school? Why or why not? I would not purchase this product for installation on every computer. Instead, I would buy one copy for every four students so teams of students could use it as they collaborate on a project around a single computers. About the Author: Carol S. Holzberg, PhD, cholzberg@gmail.com, (Shutesbury, Massachusetts) is an educational technology specialist and anthropologist who writes for several publications. She works as District Technology Coordinator for Greenfield Public Schools and the Greenfield Center School (Greenfield, Massachusetts) and teaches in both the Licensure program at Hampshire Educational Collaborative (Northampton, MA) and online in the School of Education at Capella University.